Mmm… plăcinte. Having to give these up has been one of the hardest things about going gluten-free in Moldova. 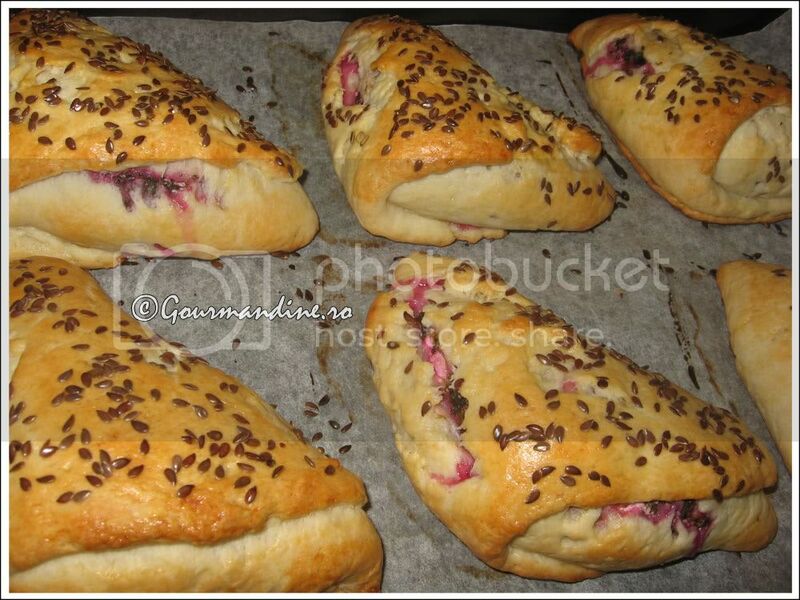 The flaky crust, the warm oozing filling… you just really can’t beat a good plăcintă. Today, I’d like to share with you the recipe that Sylvia, our school cook, uses and shared with me. My first (and possibly only) apple pie. Made to impress my starving fiancee. You tell me which word is the more accurate translation. *Sylvia didn’t tell me exactly how much flour she uses because she doesn’t know. She just adds flour until it looks right (as described in step 2). I’ve made these once but didn’t measure my flour either. Other recipes I’ve seen say 8-12 cups… so… use your best judgment. 2. Combine all ingredients, adding as much flour as needed until dough feels sticky but not too dry. 3. Cut dough into baseball-sized pieces (my description, not hers), generously flour your workspace, and roll out pieces very thinly with rolling pin. 4. 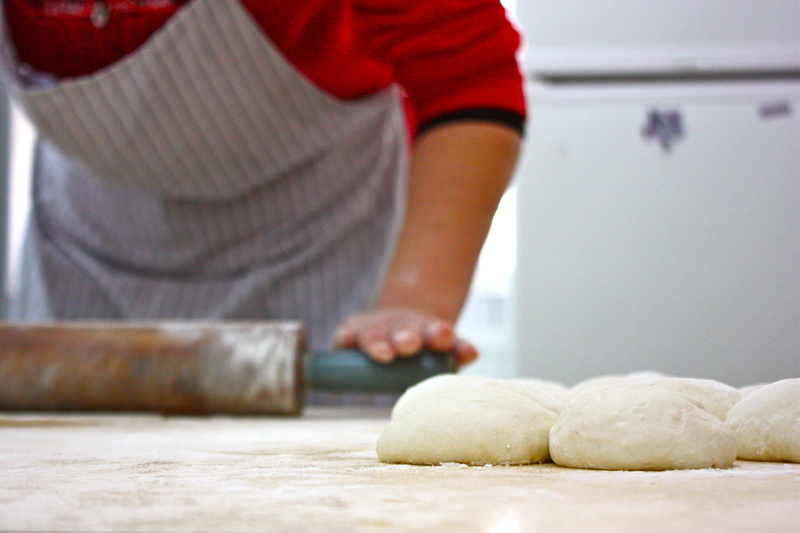 On a different workspace, cover the counter with oil and stretch dough until very, very thin. It’s okay if it tears a little. 5. 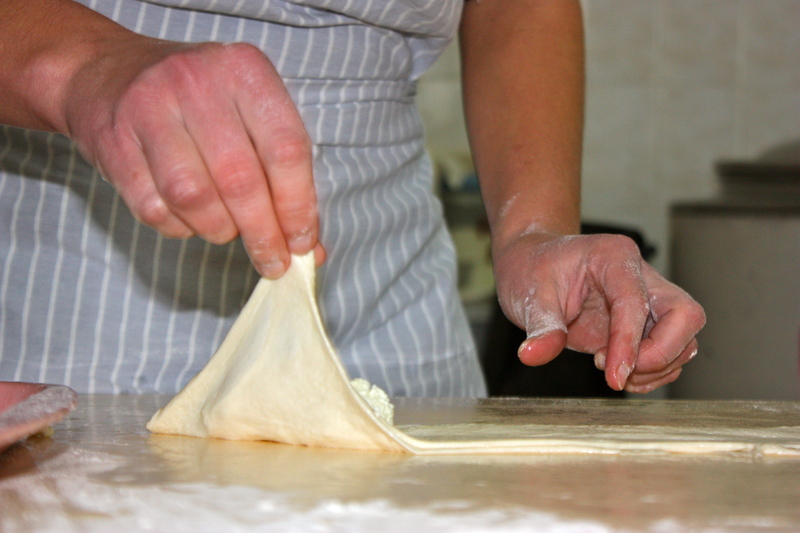 Take ahold of the end of the dough closest to you, and bring it up and away from you to fold it in half. 6. Place a generous spoonful of filling on one end. 7. Fold triangularly until it is all folded up into a nice little triangular pocket. 8. Place evenly on greased cookie sheet. 9. Bake for 20-25 minutes, or until lightly golden. 10. Boil sugar and water to make a glaze and brush on top while plăcinte are still warm, or simply sprinkle with powdered sugar. I can't believe I've never taken a picture of freshly baked plăcintă. You'll have to trust me, they are so flaky and golden and amazing! There are several different kinds of fillings that Moldovans use in plăcinte. The most common are potato, brînza (a soft, salty homemade cheese), cabbage (which is better than you’d think- it’s Josh’s favorite), fruit butter or jam, and pumpkin. My favorite would probably either be apple butter or pumpkin. Below are some instructions for making your own plăcintă fillings, borrowed from a 2005 Moldova Peace Corps cookbook, or you could just use your favorite store-bought fruit butter or jam. Potato filling: Boil 4 peeled potatoes and 2 chopped onions. Mash and season with salt and pepper. Let cool. Cheese filling: Mix 2 cups cottage or ricotta cheese, 1 egg, chopped dill, salt, and pepper. Cabbage filling: Sauté 2 cups shredded cabbage and 2 chopped onions in oil until limp. Season with salt and pepper. Let cool. Apple filling: Peel and grate 4 apples. Sauté over medium heat with ¼ cup sugar and a sprinkle of cinnamon. Let cool. Cherry filling: Mix 1 pound sour pitted cherries and ¾ cup sugar. Pumpkin filling: Boil and mash 500 grams (about 4 1/3 cups) of raw pumpkin. Add 2 tablespoons of butter, spices (nutmeg, cinnamon, ground cloves, and ground ginger… or just pumpkin pie spice) and sugar to taste. You can find another good plăcintă recipe at the Gourmandine blog (the link is to the google translate version of the website, since it is written in Romanian). There, she has also posted a lot of step-by-step pictures that are similar to the way Sylvia makes plăcinte, except that she doesn’t stretch her dough out so thin and then fold it in half. 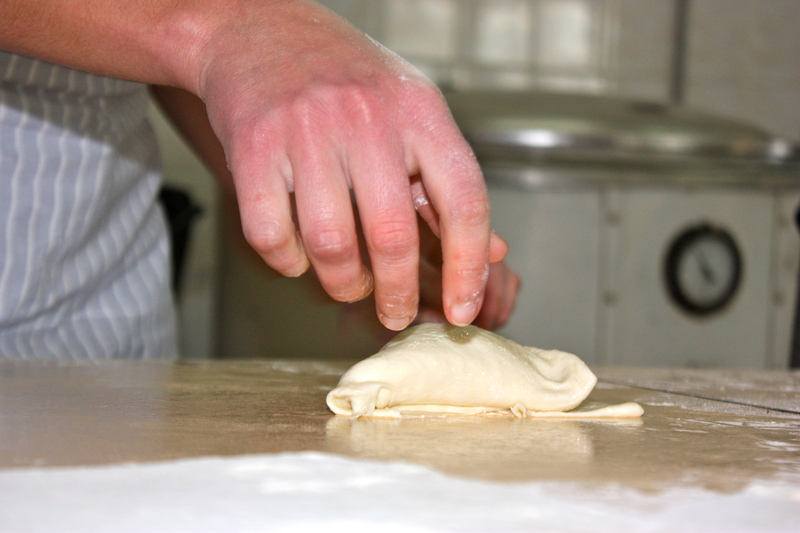 If you want to do it this way, it would be a lot easier, but your final product will just be thicker and not as flaky. Well, I hope this is enough to get you going on some authentic Moldovan plăcinte! If you have any questions, please feel free to comment or email me. Thank you Stacy for posting this. I'm excited to take them to church tomorrow for our missions banquet. I couldn't resist and had to take a try before taking them to church - and they are amazingly yummy. 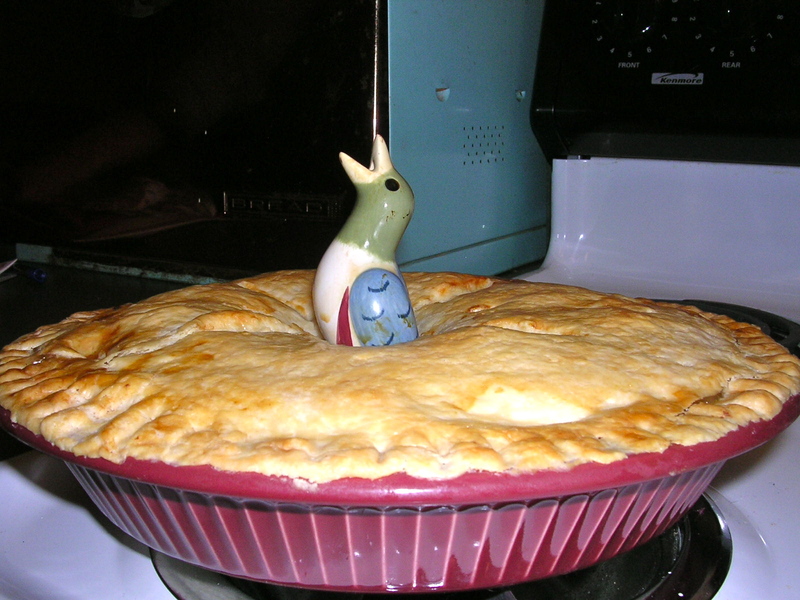 I made mine with a pumpkin butter filling since I had three jars of pumpkin puree` from our pumpkins this halloween. I somehow missed that the oil was for rolling out the plăcintă and the first 10 that I made I didn't get rolled out with the oil. Yeah, that makes all of the difference in the world (I scrapped the first 10 and made more). I love how there's several layers in it making it flaky and delicious. Morgan, I'm SO GLAD that they turned out so yummy! Pumpkin butter plăcinte sound amazing! I'm going to have to see if I can figure out a way to make a GF version of this dough, because I miss eating these so much!